Modern Family: Best Men marks the show's decline. 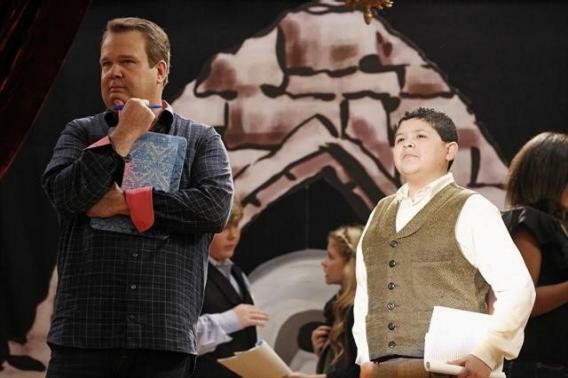 Eric Stonestreet and Rico Rodriguez on Modern Family. Photo by Peter “Hopper” Stone – © 2013 American Broadcasting Companies, Inc. I disagree with Schur somewhat—scoring cheap laughs by pandering to an audience’s political or regional biases certainly ranks lower, and there have been brilliant forms of misunderstandings on Arrested Development, Freaks and Geeks, and Modern Family. But the device does tend to grow old quickly. And Modern Family, a show I’ve long loved, can’t seem to draw comedy from anything but misunderstandings and light stereotypes, with the only variation being whether one or both parties are oblivious to the confusion. Watching last night’s episode, I could have sworn I had seen it before—it was the one where Phil misunderstands something the audience is well aware of, and Cam and Mitch squabble with each other in a frantic attempt to fix something, and Jay is frustrated with Manny as he comically laments his struggles to succeed in artistic endeavors the typical 8th grade boy isn’t usually interested in pursuing. But last night’s episode was in fact “new,” albeit only in a technical sense. It’s possible to defend such repetition: Writing in the A.V. Club last week, Todd VanDerWerff argued that Modern Family isn’t a sitcom anymore, but has become, rather, an “institution,” saying that it “has to stay as close as possible every week to what works, lest it stray too far from the stories and characterizations that work, lest it end up in some place where it alienates its massive audience.” He compares it to Cheers and The Cosby Show. I agree Modern Family is no longer a sitcom. But what it has become is not Cheers or The Cosby Show but something more like Saturday Night Live. It’s essentially a sketch show, with each week’s episode broken up into A, B, and C plots (or sketches) in which the same “Who’s on First”-style misunderstandings are not only repeated over and over, but also repeated every week when the recurring plot (or sketch) is brought back. In plot A, Phil misinterprets something while providing comic relief with his failure to match the ideal of American masculinity. Claire acts stiff and uptight in contrast to her former wild youth, and their children resort to their usual ditziness and nerdiness. In the B plot, Mitch and Cam run around with their hair on fire frantically trying to fix something that one of them or Lily has caused, usually involving a squabble between the couple in which they both blame each other. And finally, in the C Plot, Jay is frustrated both by Manny’s failure to meet his testosterone-filled expectations of the typical American boy and by Gloria’s failures to understand basic American phrases or concepts. Gloria will also usually make reference to her stereotypical Colombian drug-slum past. Not every episode contains each one of these scenarios, but they all contain at least one or two of them, mostly drawing laughs from some over-arching confusion between two characters layered over minor bits of confused dialogue. Perhaps the most apt comparison at this point is not Saturday Night Live, but Frasier, another show that relied heavily on miscommunication and cartoonish characters like Niles and Martin. Not coincidentally, I suspect, Frasier also racked up consecutive Outstanding Comedy Series Emmys. I liked Frasier—and I’m still largely entertained by Modern Family, too. But while I eagerly await the new Thursday night episodes of NBC’s sitcoms, I only tepidly anticipate Wednesday’s new rerun of ABC’s tent-pole sketch comedy.